Yakov Smushkevich was born in Rokiškis in 1902. When the Czarist regime in May 1915 ordered the Jews of central Lithuania into internal exile, his family relocated to Russia. He joined the Red Army in 1918 and in 1922 transferred to the Soviet Air Force, where he rose to the rank of lieutenant general. In the 1936-1937 Spanish Civil War he shot down several Nazi aircraft and was an acquaintance of Ernest Hemingway. He also fought in the 1939 battle of Khalkin Gol in Mongolia and in the 1940 Soviet invasion of Finland. He was twice honored as a Hero of the Soviet Union and served from 1939 to 1941 as commander of the Soviet Air Force. Smushkevich was arrested on June 7, 1941, and was executed without trial on October 28, 1941, on the personal order of Lavrenti Beria. In 1954, a year after Stalin’s death, he was rehabilitated. 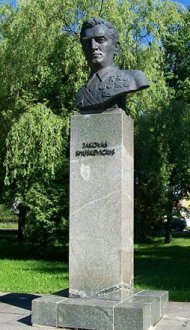 A bust of Smushkevich was created by the renowned Lithuanian sculptor Konstantinas Bogdanas. For many years it stood in Smushkevich Square in Rokiškis (a park immediately south of Laivės gatvė, between Vilniaus gatvė and Kauno gatvė). After Lithuania effectively regained its independence, in 1991, many Soviet-era statues were removed from public spaces. The Smushkevich sculpture was removed from this park around 2015.